Today we are pleased to release a new report: Hurricane Perceptions of Coastal Connecticut Residents. The report describes public attitudes and behaviors towards past and future hurricanes and tropical storms, based on a representative survey of 1,130 households along the Connecticut coast. Residents were randomly selected from evacuation Zones A and B as defined by the U.S. Army Corps of Engineers (Zone A is closest to the shoreline). 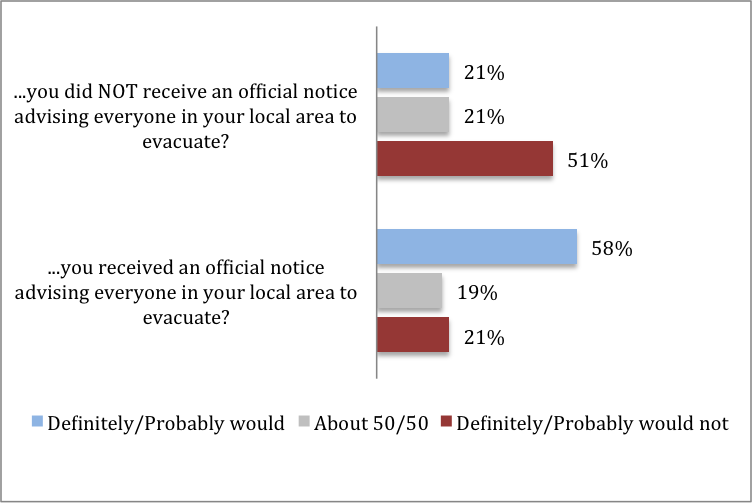 Only 21% of coastal CT residents in Zone A say they would evacuate in the event of a Category 2 hurricane if they did NOT receive an official notice; about six in ten (58%) say they would evacuate if advised to by an official. About one third (34%) of coastal CT residents believe it would be safer to stay at home during a Category 2 hurricane; slightly less (31%) believe it would be safer to evacuate, and a final third (35%) say it’s about 50/50. Coastal CT residents generally underestimate storm impacts: about half (52%) say damage from past storms was more than they had expected, whereas 19% say past damage was less than they had expected. If a Category 2 hurricane (100 MPH winds) were going to hit your local area, how likely would you be to evacuate if…? Base: Connecticut residents in Coastal Flood Zones A (n=684). Data collected Sept. – Oct., 2014. Only about one third (31%) of coastal CT residents have evacuated at least once to avoid a storm in the past six years (since the beginning of 2009). About 22% of coastal CT residents evacuated for Superstorm Sandy. In Zone A (closest to the shoreline), 27% of coastal CT residents evacuated, whereas 11% in Zone B did so. Of the Zone A evacuees, 82% left before the storm arrived or just as it was arriving. Zone A residents, on average, tend to be older, Caucasian, have higher household incomes, higher educational attainment levels, and have made more storm preparations than Zone B residents. 70% of coastal CT residents are either unsure or unaware that their home is in an evacuation zone (as defined by the Army Corps of Engineers). Three quarters of coastal CT residents (74%) have never seen a local evacuation map. Despite the enormous threat, advance notice, and remarkably accurate surge forecasts for Superstorm Sandy, the public response included many instances of confusion and poor decision-making. One of the primary conclusions from the post-storm National Weather Service Assessment was that providing the public with accurate forecasts alone is not enough to improve storm preparedness – effective communication about the risks and appropriate ways to respond is also necessary. Decades of communication research has demonstrated that effective messages require an in-depth understanding of the intended audience and a focus on the needs of that audience, rather than those of the communicator. This project assessed the coastal storm knowledge, risk perceptions, experiences, and behaviors of Connecticut’s coastal residents with a primary goal of providing emergency planners and responders a better understanding of their target audiences. 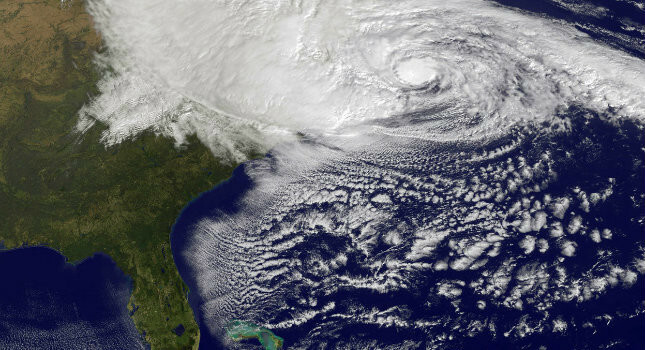 Advancing storm preparedness and communication is vital for this region as the US National Climate Assessment predicts that hurricanes on the eastern US coast will grow worse in coming decades. Funding for this project came from NOAA under the Coastal Storm Awareness Program (NOAA awards NA13OAR4830227, NA13OAR4830228, NA13OAR4830229) from the National Sea Grant College Program, National Oceanic and Atmospheric Administration, U.S. Department of Commerce, with additional support from the Energy Foundation.